The first worldwide double-blind experiments to test the power of intention have produced evidence to show that group intention is powerful enough to affect targets more than 5000 miles away. 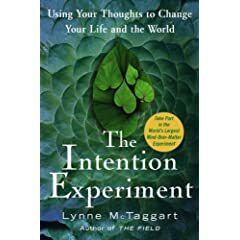 The studies, developed by Lynne McTaggart, author of the best-selling book The Intention Experiment, and a consortium of physicists and other scientists involved in consciousness research, involved thousands of people around the world to send intention to several targets under controlled conditions through the Intention Experiment website ( www.theintentionexperiment.com). McTaggart’s ‘global laboratory’ is now moving on to a ‘mini-Gaia’. The University of Arizona is constructing a little terrarium, and in early July the Intention Experiment website will carry out the first study to examine whether intention can lower the temperature. “If we find we have a significant effect, the implications of it – that our collective thoughts could tackle global warming – will be extraordinary,” she says. McTaggart is also gearing up for the first human studies, carried out with British biologist Rupert Sheldrake and America’s leading parapsychologist Dean Radin from the Institute of Noetic Sciences. She and Russian physicist Konstantin Korotkov are also designing experiments to test whether intention can purify water, and she and Dr. Schwartz are considering ‘germination’ studies, where the intenders will be asked to send intention to influence germination of seeds. What have we discovered about intention? McTaggart and Schwartz believe the very first experiments suggest some extraordinary preliminary hypotheses, which will be fully tested later. * Intention sent by a group occupying the same room to a target thousands of miles away appears to have a significant effect * A group of more than 6000 people sending intention from remote sites around the world may create an effect as large as 400 people in the same room – with targets allowing for power analysis. * For intention to work in a scattered group (as in on-line intention experiments), there may be a threshold effect. We may need to have a critical mass of more than 1000 people to achieve results. * The strongest effect may be through a coherent group effect, where the intenders occupy the same physical space. The first tests, developed by leading psychologist Dr. Gary Schwartz and his team at the Center for Advances in Consciousness and Health at the University of Arizona, examined whether intention could alter the tiny light – called biophoton emissions –emitted from living things. The tiniest change in the organism can be controlled for and measured through the use of highly sensitive CCD cameras, ordinarily used to record and photograph the faint light of outer space. The first target chosen was a simple geranium leaf. The first experiment was carried out using the attendees of a conference held by McTaggart’s publishing company in London on March 11. The 400 delegates were asked to send intention to increase the light emissions of a geranium leaf at the University of Arizona – to make the leaf ‘glow and glow’. The University of Arizona’s lab had prepared two matched leaves with similar biophoton releases, one to act as the control. Images of each leaf were simultaneously sent via the internet from Tucson to London. The audience flipped a coin to choose which leaf to send intention to, and the scientists were only told which one after the experiment was concluded. While meditative music played, the audience sent intention to the leaf to ‘glow and glow’ for 10 minutes. After the intention period, the leaves were placed in the light-tight biophoton imaging system (the super-cooled digital CCD camera system) and photographed for two hours. The results from this first exploratory experiment are currently being prepared for scientific publication. It was then time to roll out the same experiment to McTaggart’s audience of readers, which proved to have technical challenges. “The biggest challenge with these experiences was not demonstrating the power of intention but in creating a computer system sophisticated enough to allow thousands of people around the world to stare at the same ‘live feed’ computer image at the same time,” says McTaggart. After an aborted first try on March 24, when more than 10,000 people attempting to participate in the experiment overwhelmed and crashed the website, McTaggart enlisted a special team of web experts to create a special ‘off site’ web system with server capacity to cope with this many visitors. The scientists had hypothesized it was important to have a ‘live’ connection with the leaf or plant and so designed the event to have the continually refreshing photo. Nevertheless, that renewing photo represented the primary technical challenge of the experiment – the reason it required so much server power. Eventually, McTaggart’s company rented server space from a company that supplies the servers for Pop Idol, the British equivalent of American Idol. For the next experiment, they had on hand nine linked servers, which could have coped with traffic of hundreds of thousands visitors. For the next experiment on April 14, McTaggart asked her internet audience to send ‘glow’ intention to seeds of stringbeans. Some 7000 participants from 30 countries around the world participated in the experiment. This time, technology worked perfectly. The bean experiment showed a strong ‘glow effect’, but not in terms of statistical significance – largely because of the limitations of the imaging equipment. A fourth experiment one week later, on April 21, returned to the leaf, with ‘glow’ instructions–again to test the technology and server power. Although some 7000 logged on to the main site, only 500 managed to participate, again because of technical problems. This experiment showed little effect – possibly due to the technical problems. “Less than 1/6th the number of people who participated in the bean experiment participated in the leaf experiment, so the results of that experiment are inconclusive,” says Dr. Schwartz.